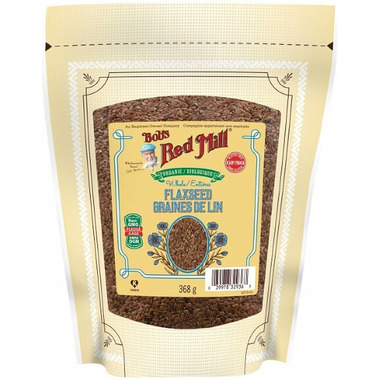 Organic brown flaxseed, also known as linseed, comes from the flax plant, which is cultivated for its seeds as well as its fiber. The seeds, which are a little larger than sesame seeds, contain omega-3 fatty acids, dietary fiber and lignans Used since ancient times, flax is renowned for myriad health benefits. Don't let the tiny, unimposing size of the flaxseed fool you. Packed inside every teeny seed is a mountain of nutritional benefit. For instance, flaxseeds are an excellent source fiber. They are also the most widely available botanical source of omega-3 fatty acids. Most Americans don't consume nearly enough omega-3's, and eating flaxseeds is an easy and tasty way to get these essential fats in your diet! Other health benefits provided by regular consumption of flaxseed are prevention and control of high blood pressure and reduction of cholesterol levels. These seeds can be eaten whole, or sprouted or ground to make their vital nutrients available to the body. Add flaxseed to bread, muffins, bars, biscuits, crackers, granola, cookies and other recipes for extra nutrition and a nutty flavor.